Here is the Baker’s Ad Circular, valid April 17 – April 23, 2019. 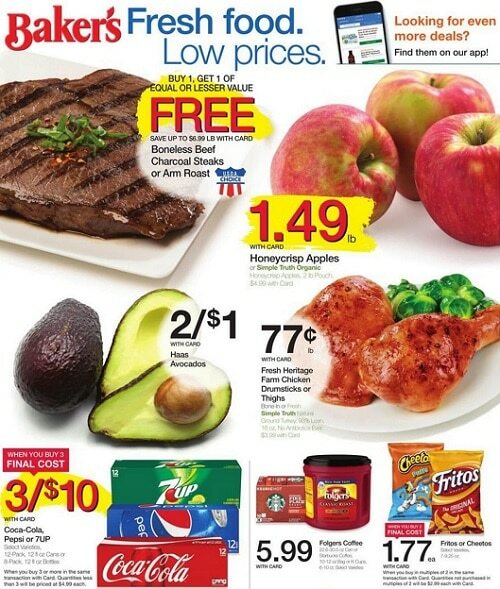 Don’t miss the Baker’s specials, digital coupons and grocery deals & promotions from the current Ad Circular. Save on almost everything you need to make a perfect meal and also use the stores services like Coinstar or Western Union – money transfer services. Match the available coupons to the current Ad to pay less for your every day groceries and household products – load the coupons to your card and show them at checkout. Great savings for Kroger Ground Chuck, Green Giant Vegetables, Crisco Vegetable Oil, Jonagold Apples, Boneless Beef Chuck Roast, Red Velvet Cakes, Earth’s Best Baby Food, Crest Toothpaste, Calbee Snapea Crisps, Coca-Cola Products, Organic Blueberries, Kashi Cereal Bars, Pantene Shampoo, Simple Truth Eggs, Colgate Toothpaste.